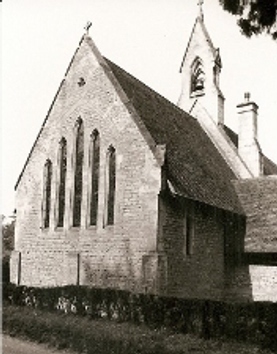 The church was built in 1855-56 for an outlying part of the parish of Mayfield, to which part of Wadhurst was added to form a district (ICBS). The architect was T H Rushforth (ibid) and it cost £1700 (PP 125). Rushforth’s later career took him away from churches; on the evidence of Tidebrook this is to be regretted. 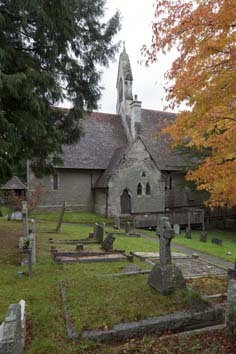 The nave and chancel are built of grey stone and the planning and detail are superior to most modest rural churches of the time. Built on a slope with an undercroft under the western nave, it has lancets and an arch-braced roof that is less steep than many. Unusually, the entrance is through a low lean-to porch at the south east corner. 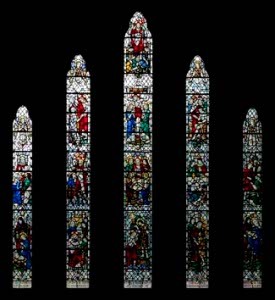 The lancets of the chancel are slightly trefoiled and five tall, stepped east ones and an open stone belfry on the east gable of the nave confirm the east end as the most important. Inside, the angles of the head and responds of the heavy chancel arch are moulded. Some of the detail of the chancel is particularly striking, including the stilted rere-arches of the east lancets, which have marble shafts and capitals and bases of lighter stone. 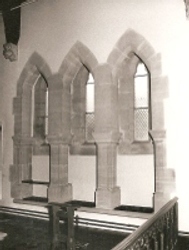 The three sedilia are in the rere-arches of closely spaced lancets, separated by free-standing square piers, of which the lower parts have moulded corners. The piers have plain abaci at window level, which serve as bases of the unadorned surrounds of the lancets above. To differentiate the chancel further, the roof, though similar to that of the nave, rests on angel-corbels. First planned in 2001, an extension at the west end was built in 2009-10 to a design by Carden and Godfrey (see under W E Godfrey (BE(E) p637). 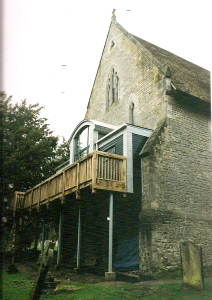 Externally, it hangs at the level of the main floor inside with a glazed centre section that is taller and has a curved roof and there is a balcony with a timber balustrade. Inside it takes up the west end of the nave and is on two levels, with what is in effect an open gallery above an enclosed meeting space. It aroused considerable opposition, but though obscuring Rushforth’s two-tier west elevation, it is certainly an unusual solution to present day requirements for extra space. Font: Massively square with shafts at the corners and matching the architecture. Glass: (East lancets) J Powell and Sons, designed by C J Edwards, 1949 (DSGW 1952). 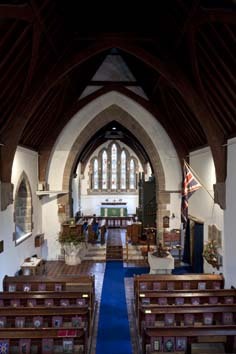 My thanks to Nick Wiseman for the photographs of the interior and the east window.